Correction of the FM sound in all stages. 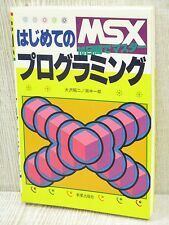 Correct usage of RAM in MSX turbo R computers. English version by Delta Soft. Wunderbar! A game that really deserves such an improvement. Thank you Victor! I don't think this deserves to be in the News... It's just a small patch... But, Thanks. Thank you for another improvement patch, Victor! I love this game, and now it's even better. Anyone interested in an updated version of the English version? Excellent releases as usual, Victor!! The current one places all text within the same Japanese characters making them appear in blocks of 4. This is less than ideal but was an MVP back in the day. That, improvements in the translation and some other improvements would be desirable for an updated version. As Victor just said, it would be fantastic, Randam! !